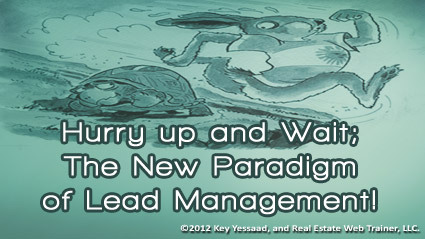 The biggest hurdle faced by Real Estate Agents and their Lead Management Systems is the implementation of ‘Intentional Patience.’ The Internet, The Economy, and your Local Real Estate Market Conditions have extended the time from initial Home Search to consummation of deals from about 3 months to a period hovering between 10 to 12 months. The pouncing on deals and buying on impulse has nearly disappeared, and has been extended beyond the capacity of Real Estate Agents to remain focused on such leads. It is like being an Olympic Sprinter who is asked to first run a Marathon before finishing with a fast sprint; the waiting is grueling. The Real Estate Professionals who design patience and a long term view are the ones being rewarded today; they have come to understand that you cannot rush the decision making in the first few months but the moment the fuse is lit the Buyers are ready and they want you to hurry and work faster - You have to know when to be the Tortoise and when to turn it on and run like the Hare!